Yvonne Cleaver graduated from the National Art School in Sydney, Australia in 1980, topping the year and winning the painting prize. During her education, Yvonne studied under notable Australian artists Margaret Woodward and Clem Millward. Since that time, she has exhibited her work in six solo exhibitions. The latest exhibition in 2014 entitled ‘Where the Wild things are’ was held at Eramboo Artist Environment Sydney Australia. There have been many group exhibitions including Stations of the Cross – a religious themed exhibition by some of Sydney’s leading painters. Yvonne has received recognition in a number of art awards and had her work featured in Australian House & Garden magazine. She has also undertaken several large-scale commercial commissions including 43 paintings for Macquarie University’s School of Business studies and eight paintings for Amways Sydney Corporate offices. Her works hang in private and commercial collections in Australia, Canada, Europe and the United Kingdom. 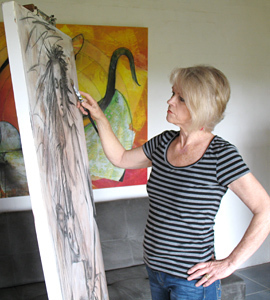 Further to her art career, Yvonne has been teaching art in Sydney since 1980.